Revitalizes epidermis and dermis which contributes to bringing back vitality and bounce to the skin. Several biological compounds based from chlorella, proteoglycans and hyaluronic acid. These compounds contain a mucoglycoproteins complex, chondroitin sulphates, mucopolysaccarides and native hydroxiproline. Palmitoyl oiligopeptide, a chain of 5 amino acids bonded together and linked to a fatty acid. Proteoglycans and hyaluronic acid make up a major part of the extra-cellular matrix, the material between the cells that provides structural support. Palmitoyl oligopeptide increases collagen and elastin production speeding skin’s healing. Dehydrated skin, fine lines around the eyes and on the neck. Loss of skin vitality and bounce. The hydrophilic properties of the active ingredients help to retain larger quantities of water, restructuring cutaneous tissues. These compounds are revitalizing and nourishing. The skin recovers its vitality and firmness. 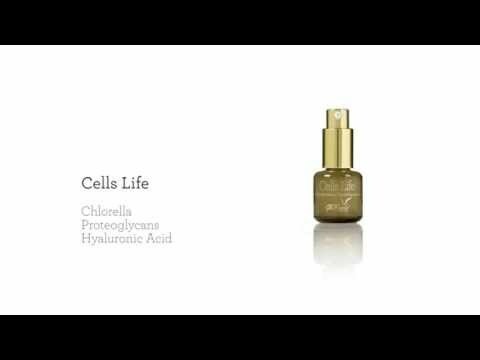 Cells-Life can be applied before or after all other creams or after Hydra-Ger Mask. 2 out of 2 (100.00%) reviewers recommend Cells-Life to their friends. I used Cells-Life after surgery on my knee. My scar healed beautifully and rapidly! Very happy with the results. I use it for my eyes and neck and it has made a difference to the fine lines! It is pricey so I use it sparingly and more for maintenance now. [post_content] => Revitalizes epidermis and dermis which contributes to bringing back vitality and bounce to the skin.